Many news outlets are seeing vast leaps in web traffic from mobile audiences as ownership of smartphones and tablets increases. Accordingly, many organisations are focusing more attention on mobile-first strategies that ensure a good user experience, no matter whether a person is accessing content from a desktop computer, tablet or smartphone. The Wall Street Journal, The Boston Globe, CNN and Hearst Magazines UK are just a few outlets that are doing interesting things in terms of mobile strategy and engagement at the moment. Journalism.co.uk spoke to mobile editors and experts from these organisations, and also from Knight Lab at Northwestern University, and asked them to share their tips for mobile-first journalism. 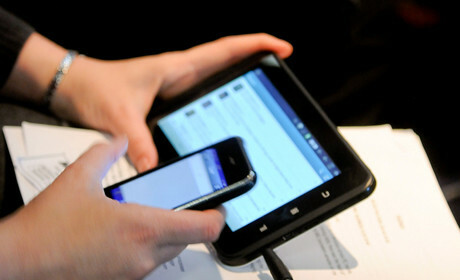 Damon Kiesow, mobile editor at The Boston Globe – one of the first major news websites to undergo a responsive re-design in 2011 – said that a key facet of mobile journalism was to "really understand your users". "[Understanding] is the key to success everywhere but it's certainly more important as you move into mobile," Kiesow told journalism.co.uk, "which consumers feel is such a personal device – they carry it with them all the time, they're always using it, they're checking it, potentially, a hundred times a day. "You certainly have a higher standard for reach when you're creating products and experiences for mobile than you do, for instance, on the web." Hearst Magazines UK has seen mobile traffic to its websites grow 70 per cent in the last six months to 40 per cent of overall traffic. "With some brands we get a lot of heavy use from smartphones," he said, "and others you get it from tablet and digital editions, and what we do is we start curating and refining the experience so it really works for that consumer. "With some of the younger demographics, ultimately everyone has a smartphone but not everybody has a tablet. You have to be conscious of that when you're designing a product." Another way to understand your mobile audience is to use mobile analytics to learn when and where they are most likely to access the site or edition, tailoring content and publishing times accordingly. Miranda Mulligan, executive director at Knight Lab at Northwestern University, noted that it is important to take note of where and when mobile traffic fluctuates. "If we think specifically about how people are connecting to our websites on average – and if our mobile average is around 25 per cent – it's easy to be dismissive of that audience," she said. "But during peak traffic times there is 50, 60 or 70 per cent of our traffic coming to us on mobile, so it's a lot easier to make a business argument to improve the reading experience and storytelling experience on mobile." Etan Horowitz, mobile editor at CNN, says that while the hours between noon and 1pm on weekdays are traditionally peak traffic times for desktop audiences, when people at work are likely to be taking a lunch break, mobile traffic is generally much higher during evenings – between 8pm and 11pm – and weekends. He noted where news breaks later in the day, it's likely to be "a bigger deal" on mobile. "For example when the US government shut down [in October 2013] it happened around midnight, when there are very few people that are on a computer but there are a lot of people that are on a phone or a tablet. So for that story it did better on mobile than it did on desktop." "It's really striking to see the connection between social media and mobile," said Horowitz. More than 75 per cent of active Twitters users access the platform via mobile, whereas 48 per cent of daily users on Facebook come from mobile, so it is no surprise that social platforms have impact on the number of people clicking through to mobile news sites. "If we [CNN] post a good viral video clip on our Facebook page around midnight [EST] we've had one or two cases where that video has become the most popular video on the mobile website for the entire next day," explains Horowitz. "It's very clear that when a story does well for us on social media it also does well for us on our mobile platforms and vice versa." "For a long time a lot of what we were doing - and by 'we' I mean news organisations in general – was sort of regurgitating content off the web and shoving it onto mobile," said David Ho, editor of mobile, tablets and emerging technology, The Wall Street Journal. "When I preach mobile to journalists I tell them we no longer live in a one-platform world so the news, the content they create, goes everywhere – to newspapers, to phones, to laptops and desktops, to giant smart TV sets, to apps, to aggregators. "For example, I would advise folks never publish anything with the words 'click here' or 'mouse over this' or 'see video below', because there's a good shot that your audience isn't using a mouse, and that the video may not be below the article anymore." Ho added that while many news outlets were still "really focussed on responsive", the emphasis should be on creating "mobile-first storyforms" which are designed to take advantage of the capabilities and the ubiquity of the smartphone. "It's not enough just to take a map that we run in print and make it a Google Map for the web and then shrink it down for a smaller screen. "You know how they say 'show, don't tell'? I think the next thing is 'feel, don't show'," he said of the possibilities that mobile movement sensors may hold for storytelling. "And we're just getting started in exploring how that will work." This shift towards adaptive content is something Damon Kiesow referred to as "responsive web 2.0". "Once you have that foundational level of being able to serve the web to all these different devices, the next step is adaptive content and thinking about how to make what you're serving not only fit people's device, but give them the best experience possible on that device," he explained. CNN does occasionally write different headlines for mobile and web, although Horowitz said "a really good headline will work for all platforms". "Often for some of our stories you may see videos and stories as just a text link," he explained, "so we have to make sure that is still inviting [for the user]." "That's a good example of something that, wherever it shows up – whether it shows up with a picture or it doesn't – that's something that's people are going to want to click and check out," he explained. However, Horowitz added that it also works well on mobile to have "very deliberate headlines" that make it clear what users are going to get when they click through to a story. For example, on a story like last November's Typhoon Haiyan, instead of the headline 'Typhoon comes ashore' he might use 'Watch typhoon come ashore' or 'See typhoon come ashore', he said. "That really makes a big difference," he continued, "because people want to know, specifically when they look at a mobile platform, 'what is this going to be when I tap on it?'" One thing the Wall Street Journal is putting a lot of time and effort into, said Ho, is producing graphics and other kinds of news experiences that are really focused on mobile and mobile devices. "Making graphics - both static and interactives - that work well across all screen sizes is one of the bigger challenges of mobile news," he explained. "Exploring responsive graphics that look good and still make sense on phones and tablet and desktop." One example is photo spheres: 360-degree panoramic photos that can be controlled by motion and zoom on mobile. "We're definitely thinking about ways to tailor experiences specifically for mobile devices," added Ho. Miranda Mulligan said that in order to have a a successful mobile strategy, the culture of media companies needs to change so that journalists, designers and developers are working much more closely together. "Traditionally there's a disconnect between the technologists and the people that are writing and creating the stories, she explained. "If I were to make a call to arms, it would be that we need to find a better way of working together. I don't necessarily believe that a storyteller needs to be building every single bit of the technology as well as crafting the story, but we need to be working better as teams. "So the reporter who's been following a beat around a story knows more about the technology possibilities, and can indicate early enough that the technologist will be able to build an experience around the storytelling opportunity." One final thing for news outlets to note, said David Ho, is that mobile "isn't the end game of all this, it's only the beginning really". "Mobile is part of this larger change where technology or digital information is becoming much more intimate, much more an extension of ourselves," he explained. "As we focus on mobile now, we also need to keep an eye on what's next – smart watches, smart glasses, other wearable computers. Beyond that we have the internet of things and thinking about how news and information interacts with that. It's a pretty exciting time."